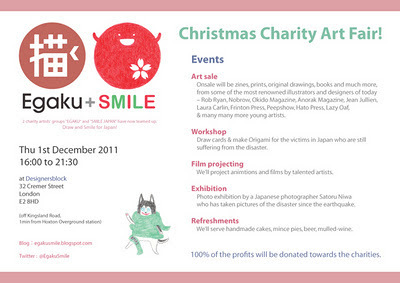 Nanae Kawahara blog from 2010 to 2011: EGAKU + SMILE Christmas Charity Art Fair TOMORROW !! EGAKU + SMILE Christmas Charity Art Fair TOMORROW !! EGAKU + SMILE Christmas Charity Art Fair is TOMORROW!! I'll update the news in this blog, CHECK IT OUT !! Lovely decorated cakes made by Anna and her friend. I just finished to make these donation boxes, and they will welcome you at the fair! The Husky one is on the flyer as well. Anyway, PLEASE PLEASE COME TOMORROW if you're in London!! BUST Magazine Christmas Craftacular TOMORROW !! my illustration is on PAIN de CONA website!